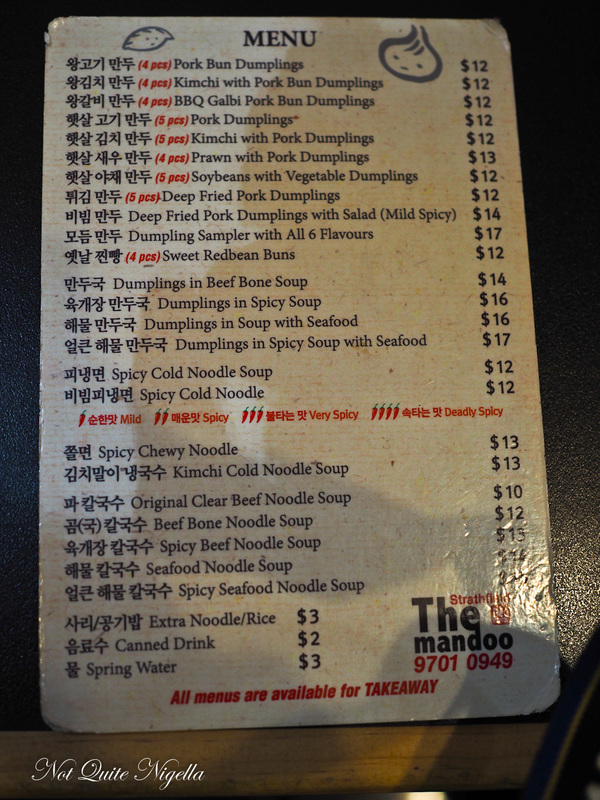 I had all but given up on my $25 or less per person restaurant section but then along came The Mandoo. 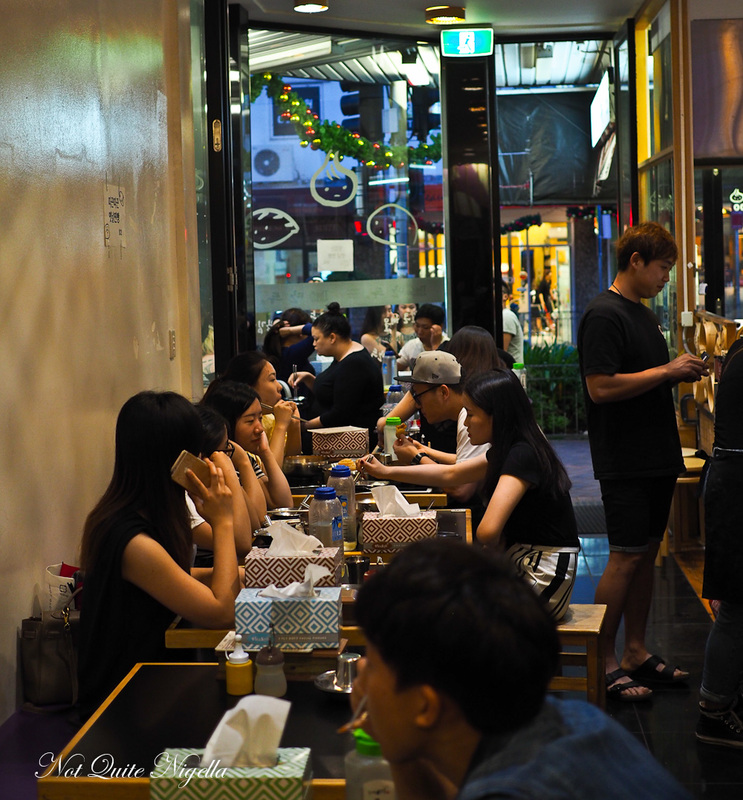 Located on The Boulevarde in Strathfield this small Korean restaurant sells just two things: ENORMOUS dumplings and noodles. 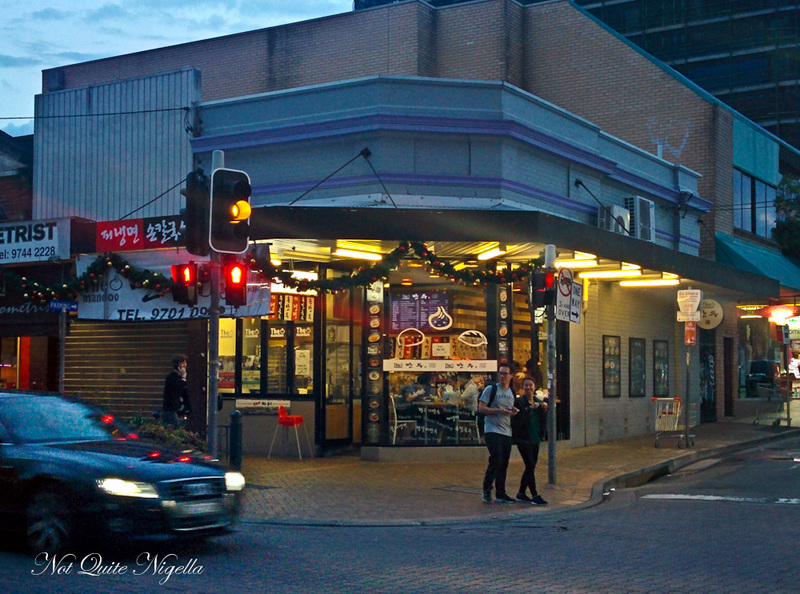 It was a Tuesday night and Mr NQN and I had asked my parents along for the ride. My mother loves Asian food of all kinds and we figure that we can sometimes pass off Korean and Asian food as Chinese food to my father. 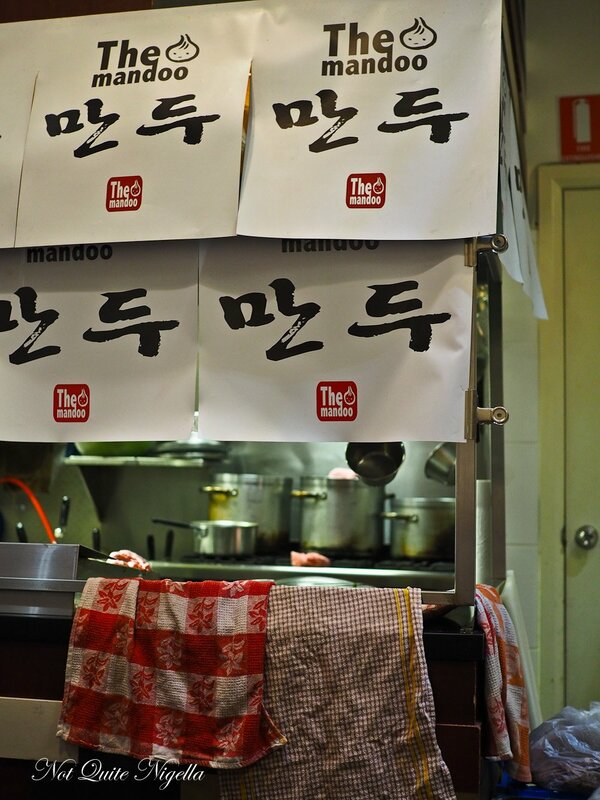 The Mandoo's menu has 15 types of dumplings and 9 types of noodles. We go by the waitress's recommendation as quite honestly we want to eat it all. It's a busy place so you're best to book. The noodles come out first. 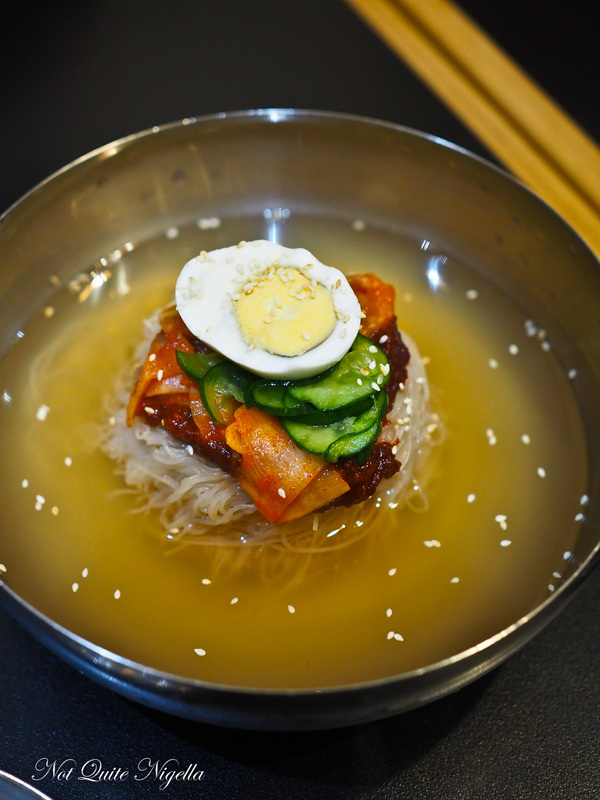 These cold thin noodles work a treat for this warm weather and are slippery and tasty with just a hint of spice. There's a layer of spicy chilli paste, kim chi, cucumber pickles and half a boiled egg. You take to them with the pair of scissors provided and just hope that you get most of the noodles in your mouth. Don't wear white, just don't, trust me. The chewy noodles are a crunchier, chewier number with lots of chilli paste, bean sprouts, cabbage, spring onion, boiled egg and chewy sweet potato noodles. I slightly preferred the chewy noodles because of the amount of chilli added to them although these were too spicy for my father. Then they bring out the metal steamer layers, four in total. 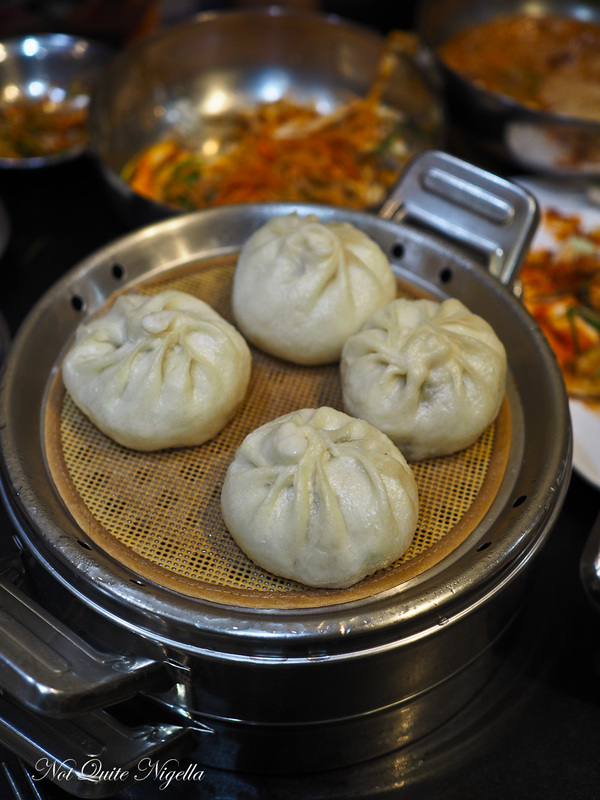 I start with a bbq galbi pork bun dumpling, a soft fluffy number with minced pork galbi inside. It's quite good but I think I ended up preferring the other dumplings. The prawn and pork dumplings are a favourite at the table. 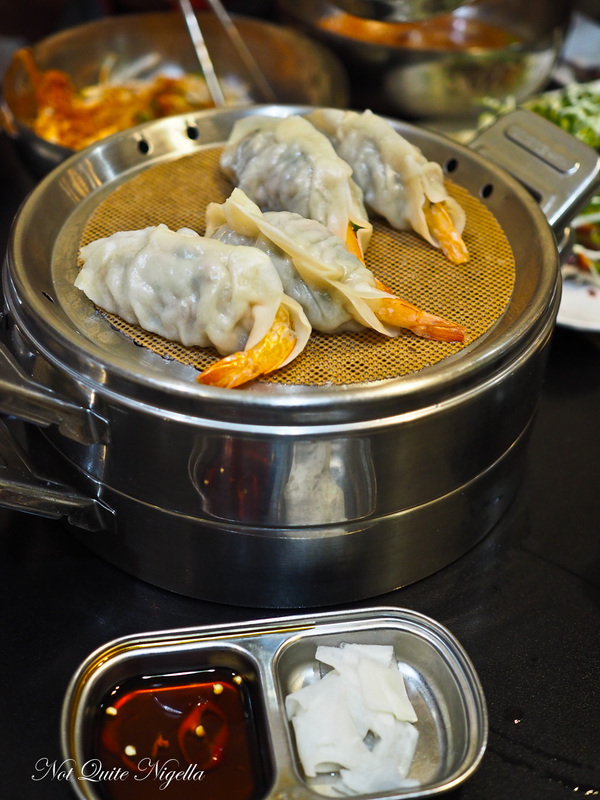 Each dumpling is a large king prawn wrapped with seasoned pork mince and then dumpling skin. These dumplings are not single bite morsels. They are huge and require four or five bites each. You can get the deep fried dumplings either as they are or in a salad. 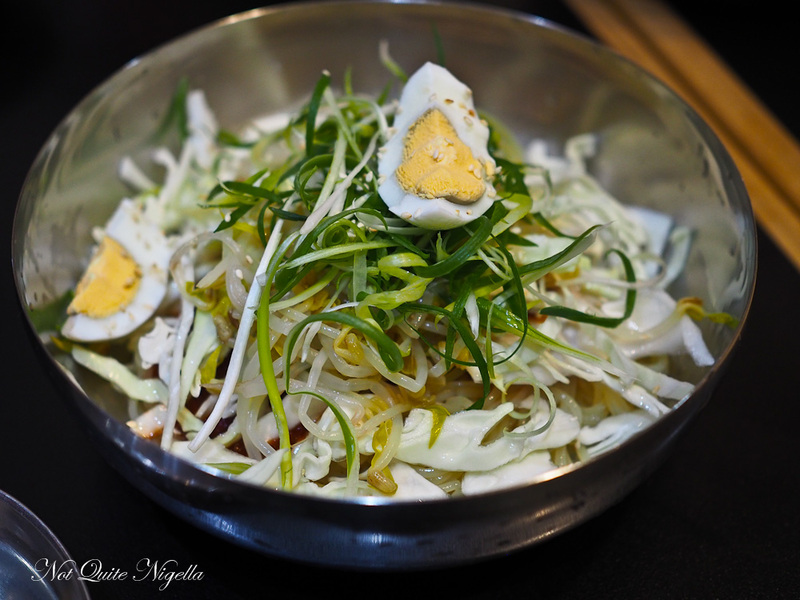 I love salad so we decide to go with this version. 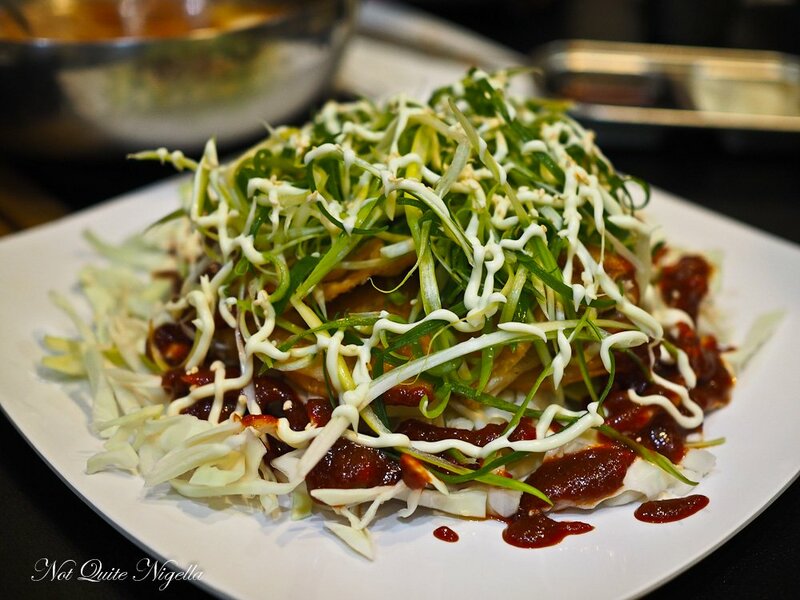 It comes with a cabbage and spring onion salad and plenty of chilli sauce on it. They're crispy but not greasy and even Mr NQN who doesn't enjoy deep fried food much takes three pieces, prompting a side eye from my mother who adores deep fried food. 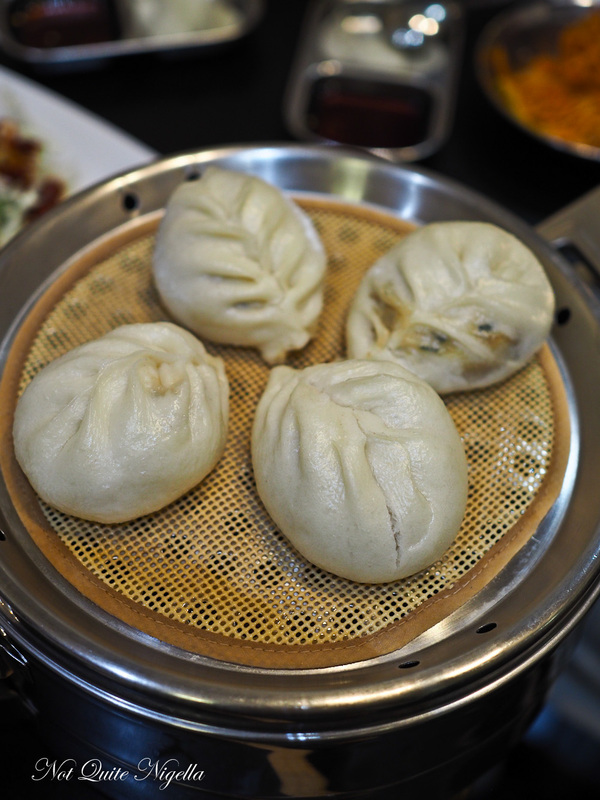 The pork bun dumplings are similar to the Chinese pork dumplings but taste slightly different. There is no crispy bottom or soup in these but they're generously filled with the pork stuffing. I quite like dipping these in the chilli sauce over the vinegar that they provide. 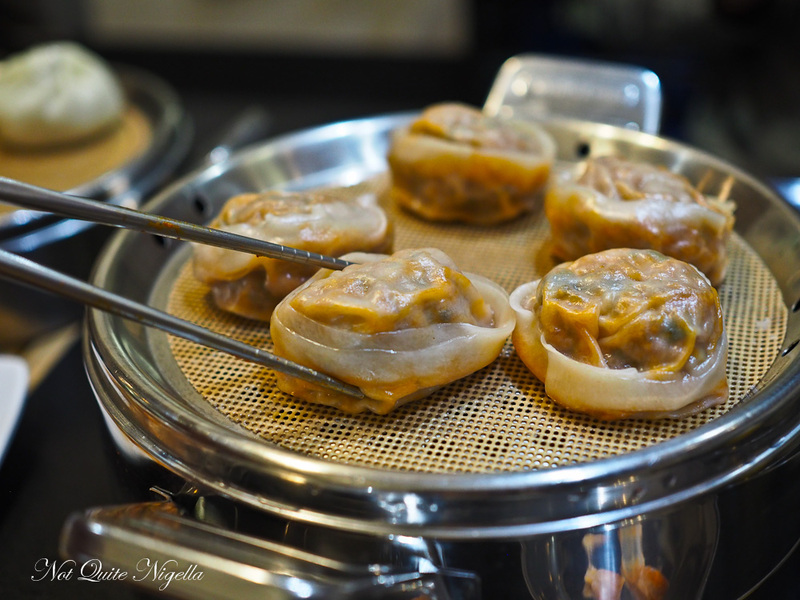 The kimchi and pork dumplings however are my favourite dumplings along with the prawn ones. They're enormous too but they have a very thin, semi translucent skin with a lightly spicy kimchi and pork mince filling. These are fantastic dipped into the vinegar and followed with a piece of daikon pickle. I didn't see the sweet red buns on the menu but sometimes you want your last taste to be your favourite one so we left with savoury flavours dancing on our tongues. And the bill? Just $88 for 4 people. "Lucky number," says my mother nodding with approval. So tell me Dear Reader, do you have any favourite cheap and cheerful places to eat? Do you find it easy to find places $25 and under?